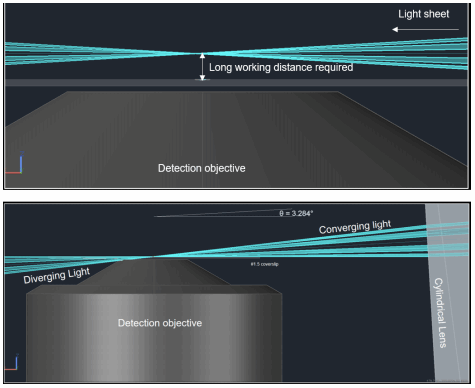 When the detection of a cellular or subcellular structure requires a high NA detection objective for the superior resolution and light collection efficiency, conventional fluorescence microscopy and Light Sheet Fluorescence Microscopy (LSFM) encounter challenges. Imaging these structures is difficult and could only be achieved through multi-view SPIM geometries with a 1.2 NA objective and subsequent deconvolution – an incredibly time consuming and data heavy process. 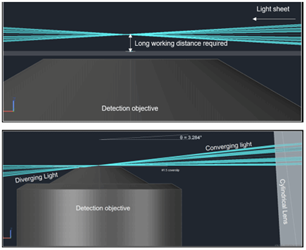 Lateral Interference Tilted Excitation (LITE) microscopy overcomes this problem by eliminating the illumination objective and introducing a tilted light sheet through a photomask and cylindrical lens that can converge at the working distance of high NA objectives. Download the full paper for more information on this technique, as well as its advantages and setbacks.